Another beautiful day here at Wittman Field. But thigs are definitely winding down. The crowd all week have been very large, and enthusiastic. It's been a great week. I'm about to post a bunch more pics over at the flickr site. Check there in a little bit. I'll be travelling tomorrow, so no updates. But I'll try to do some sort of wrapup when I get home. They started work on the plans-built plane at the beginning of this year, and are making good progress. "We have lots of the wood work done, and we’re going to start covering it with fabric after we get some of the varnish done," explains Elizabeth, who seems to be the spokes-twin for the team. "Okay, you guys should see it now … Can you see it yet? Can you see it? … Is it shaking the house yet? … Does it look pretty cool there? … Yeah! … Okay, well, I’ll talk to you later. Love ya." Things have been keeping me busy here. Having fun. Seeing lots of airplanes. Meeting lots of people. I've made a couple of forays into the Fly Market. Readers from past years will know that I have a weakness for the odd doo-dads and junk you can get there. At $23, the sunglasses cost more than the rest of the stuff combined. The crowds continue to be real big this year. If the week so far is any indication, today and tomorrow, which are usually the biggest day, should be huge. Also, Miraclebaby is posting AirVenture pics. So is KAP'nCraig. Tori flies with her dad, and has not yet begun lessons, but that’s about to change. "I’m gonna start taking lessons in the fall. I just graduated college, and that was the agreement, as soon as I graduated I could start taking lessons." Here's a great pic, from the AirVenture site, of SpaceShipOne on the West Ramp. Photo by Dennis Biela. Flying is a great tradition in the Behringer family. "I’ve been flying close to 30 years now," says Scott. "I started in my teens. My parents were both pilots, so I was flying while I was a young kid. I soloed on my 16th birthday, got my license at 17, that’s been about 30 years ago." Who taught Scott to fly? His mom. I added a bunch of new pics on the flickr site. Yesterday was the first official day of the event. Based on my unofficial estimation, the crowd seemed much bigger than a normal day one. 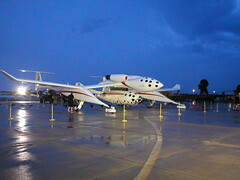 The big event of the day was the arrival of Burt Rutan's SpaceShipOne and White Knight. The spacecraft/lift-aircraft combination distracted the crowd for about a half hour before its scheduled 3pm arrival by flying around the area at high altitude but clearly visible to the waiting crowd. Then at 3pm it descended into the pattern, and did three fly-bys for the appreciative crowd. After landing it taxied into the West Ramp area where it now sits on display. Another highlight for Monday was the display and flights of Glacier Girl. This P-38 WWII era fighter was rescued from the Greenland ice ten years ago, and has been in restoration ever since. Monday night featured some of Oshkosh's legendary thunderstorms. They started rolling through around 7pm, and one after another, boomed through the site till nearly 2am. Pretty rough on the tent campers. This morning dawned gray and rainy, but as the day progressed the rain let up and the sun even occasionally peeked through. Today's big event was supposed to be the arrival of the round-the-world aircraft Global Flyer. But we've just been told that it has been delayed until tomorrow. Today's crowd seem bigger than usual too. If this continues we could be in for a record breaking week at AirVenture 2005. I'm about to go post a bunch of pics on flickr. I'll post something here when that is done. One particular memory is from a few years back: "When they had the Tomcat, the Bearcat, and the Hellcat all flying together, around the pattern. That was extremely memorable." Early arrivers are one of the great traditions of AirVenture Oshkosh. Camp Scholler opened a month in advance this year, with campers arriving from the very start. All around the field, aircraft are arriving early for the fly-in, too. In the Vintage parking area, just south of the Theater in the Woods, campers were arriving almost a week before this year’s official start. 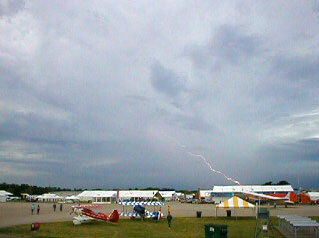 It's shaping up to be a hot humid day here at AirVenture Oshkosh 2005. Today is what some of us call "Day Zero". The show doesn't "officially" start until tomorrow, but many people come today to check out the early arrivers. Many showplanes -- homebuilt, military, commercial -- have arrived. And a lot of the exhibitor vendors plan to be up and running by today. So there's already much to see and do. There's no airshow today. But I'm expecting some cool arrivals that I'll try and get pics of. I've posted a bunch of Oshkosh pics over on the Flickr site. I managed to catch this bolt in a video I was taking of the approaching storm. We just had a little excitement here, as a monster t-storm was bearing down on us. The line has passed us now, and it both, dissipated, and veered to the south, so the worst of it missed us. Nevertheless it rained pretty hard for awhile. And we expect it to rain for a while longer. The Bonanza and Mooney arrivals have been delayed. Just a reminder that, due to an idiosyncrasy of the internet connection here, I'm not able the see mail sent to my regular @da4.com addresses. They're not being lost, but they are forming a huge pile of mail that I'll get to wade through when I get a good connection again. Sad news. The yodeler died. Every morning here at AirVenture, at 7 am, the yodeler would come on the PA and wake us all with a joyous call to arms. "Good morning Oshkosh" Followed by the sound of a turbine engine spinning up, then, just as the turbine would reach full pitch the sound would change to a sputtering biplane engine. The yodeler would sing, recite poetry. Some mornings he'd have guests singing with him. One morning a woman played the flute. Then he'd yodel, and if you were down at the comm center watching him out on the announcer stand you'd see that while trilling he'd wave his arms, dance, do a little jig. He was happy about life and the start of a new day at Oshkosh. It all lasted only a few minutes, and was concluded with his happy cry of, "OK, let's go get 'em!" Some people didn't get it, but I always thought it was a great way to start the day. For the past few years I've made a point to be down there to watch him each morning. He usually drew a small crowd, but some mornings I would be the only one watching. One morning, while waiting for 7am, he said hi to me from the stand. We chatted for a few secs about the weather, his airplane, coming to Oshkosh. Just a regular, nice guy. Most of us didn't know his name. He was just the Yodeler. Bill Ricketts died on June 21 from lung cancer. But the yodeler will live on. Thursday nite: Day Two wrap up -- Arrived in OSH at 8pm. Later than I'd hoped for. Each year I seem to be in denial about how long it takes to drive here. I always arrive about 3 hours later than I expected. Other than the thunderstorm that I wrote about in another post, it was uneventful. Even the traffic in Chicago was relatively tame. Two slowdowns for about a total of 30-45 mins. Not nearly as bad as past trips. The row I camped in last year was already full when I arrived. Well, not full, but completely reserved. I claimed a spot in the next row closer to the runway. Row 43. My neighbors this year are Ed and Jane from Ohio. They are staying in an incredibly long motorhome. No exaggeration, I think there's more floor-space in this thing than some apartments I've lived in. Today's plan is to wander around a bit. Do some interviews for the column. Take some pics. And get set up down at the AirVenture Today office. Tonight is the annual pre-show party given by staff photographer Phil. It's always a lot of fun. Thurs, 2:47 pm CDT -- I drove right into the middle of a severe thunderstorm. Torrential rain, high winds, zero visibility. Hail. Lightning in all quads, and occasionally very nearby. I seldom get spooked by these storms when I'm driving. But when visibility went to a couple car lengths I pulled over. I took shelter under an overpass. So did a lot of others. It only lasted about 10 mins. But it was cool. Thurs 11:35 am EDT -- One of the things I like to do during this drive is tune into a syndicated morning radio show call "The Bob&Tom Show". It isn't available in NE. It's on a lot of smaller-market, midwest stations. I first discovered the show during an OSH trip years ago. Now I like to tune in each year. Two funny guys, with a great supporting cast, and good guests. I usually find stations playing B&T by scanning the dial as I drive each morning. In the process of doing that today I came across Howard Stern. I listened for awhile. I've never been a fan of Howard. His humor doesn't do it for me. I don't think there's anything wrong with it. It just doesn't make me laugh. But over the past few years I've become an alt-Howard fan, because of the abuse he's taking from our government, and the fearless stands he's taken in confronting that abuse. I don't get his humor, but his views on censorship, civil rights, gay and feminine rights, are right-on, and, I think, very brave. Thurs, 11:30 am EDT, I80/I90, somewhere between Cleveland and Toledo -- I expected that gas prices along the route would be pretty high. Especially on the interstate. I've been paying $2.29-2.30 for the past month in the Seacoast area. I thought the road gas would be $2.50 and above. I almost did a fill-up in Keene NH when I saw $2.27, but I was pleasantly surprised to discover prices in the mid to low 20s all across Vermont. I got a fill-up in Bennington for $2.23. Once I crossed onto NY state though, they immediately jumped by 20 cents! And that was just the local stations along NY Route 7. On the interstate they were about the same. $2.39 to as high as $2.45. But not as high as I expected. Then in Pennsylvania prices dropped into the teens! $2.17 all over the place. Of course I had just filled the tank for $2.39 in NY. I'm about to buy gas here in Ohio, and I didn't get a look at the price, but overall I'm way under-budget for gas expense so far. UPDATE: I drove around the corner in the service area to discover gas at $2.19! The cheapest I saw on the drive was $2.09!! Written Wed July 20 pm -- End of day one of driving. Pretty uneventful drive today. I took a slightly different route than in past years. Usually I take NH101 through Manchester down to Keene. But this year I went through Concord NH, and took US202 down to Peterborough. I should have taken NH9. It's a more direct route from Concord to Keene. But there are some pretty, and new to me, sights along the road. From Keene I took my normal route across Southern VT. As usual, the towns of Brattelboro, Wilmington, and Bennington just charmed me to death. They remind me of Stars Hollow. Down into NY state where I picked up the interstates. I87 to I90. Up the Mohawk River Valley. I've written about this before. It's the route of the old Erie Canal, and the highway follows along the river and canal. I like to imagine what it must have been like to see the river barges going up and down the waterway. I usually push on during this first day to at least past Buffalo. But my early to bed sleep schedule of late had me yawning, so I decided to stop sooner. In Seneca just past Rochester NY. I'm hoping to get a good early start tomorrow and arrive in OSH well before dark. More later. Soon I'll be posting some blog entries and pics that I made while traveling. I still don't have my regular email working, so if you want to contact me use my special email account: aroundthefield2005@gmail.com. The packing is just about done. I have a few more errands to do. Final goodbyes. Then I'm on the road to Oshkosh. EAA used to give out "Oshkosh or Bust" window signs for us to put in our planes and cars. They're a little too professional for that now. Too bad. I'll be offline till maybe Saturday. But I'll be writing blog posting while unwired, and taking pics. I'll catch up then. "Al's Morning Meeting", which is a daily resource for journalists, has a lot of interesting info and links this morning about Supreme Nominee Roberts, and the nomination process in general. I'll be posting my OSH pics to my flickr account under the tags AirVenture, Oshkosh, and 2005. You can check back there on a regular basis, or if you use a newsreader you can subscribe to this feed. 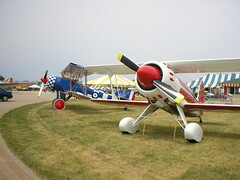 Here's a photo set on flickr from msprague who took a bunch of pics at AirVenture 2003. I've been busy the past few days on finishing things up, and doing travel prep, for heading out to AirVenture Oshkosh 2005. Once again I'll be driving the good old Jeep Cherokee, and rigging the back out as an impromptu camper. If it's not too ugly I may post some pics of what that ends up looking like. The drive will take me SW to Keene NH, across Vermont, upstate NY, PA, Ohio, Illinois, Indiana, loop around the southern tip of Lake Michigan, and up into Wisconsin. The plan is to leave mid afternoon on Wednesday, and arrive late afternoon on Thursday. Soon I'll be returning to the land of temblors and the Richter scale. No, not the west coast, but the great american midwest. A colossal earthquake that caused damage from South Carolina to Washington D.C. and temporarily reversed the course of the Mississippi River nearly two centuries ago could be repeated within the next 50 years, scientists said today. Strain is building on a fault near Memphis, Tennessee that was the site of a magnitude 8.1 earthquake in 1812, according to new observations that settle a debate on the risk of another huge quake. The odds of another 8.0 event within 50 years are between 7 and 10 percent, geologists said today... Such a strong earthquake would rock the entire eastern half of the country and prove devastating to the local region. A lesser but still damaging quake of magnitude 6 or greater has a 90 percent chance of striking in the next five decades. For the past few days I've finally gotten into Oshkosh preparation mode. I've been so busy with my other projects this year that I haven't been able to get too excited, as early as usual. But I leave in three days, so the time is here. I've been collecting up AirVenture/Aviation teaser items that I wanted to blog, and I hope to post them over the next couple of days. In the mean time, check out the website to see what's happening this year. It was supposed to be a magical moment. Curt Schilling was supposed to shut down the Yankees and close out the game for a Redsox win. That's not quite what happened. In his first appearance as reliever, Schilling gave up two runs, allowing the Yanks to take the lead, and ultimately the win. In his first time back to the mound in two months, Schilling gets the loss, and the expectations of Redsox Nation are deflated. But let's not panic. Curt lost a disappointing game early in last year's playoffs, only to come back, surgically lashed together, to save the day. He figured it out back then, let's give him a chance to adjust, and make it work this time too. Online video of highlights from the recent Live 8 concerts. In 2008 NASA's Lunar Reconnaissance Orbiter will carry a powerful modern camera into low orbit over the Moon's surface. Its primary mission is not to photograph old Apollo landing sites, but it will photograph them, many times, providing the first recognizable images of Apollo relics since 1972. For those of you who are paying attention, my blogging activity has been pretty low lately. Don't panic. I haven't quit blogging. Let me explain. A number of things in my life have combined to reduce the blogging. For starters, it's summer. So there are way more attractions outdoors, away from the keyboard, this time of year. Especially this summer, when a side effect of my SoBeDi experience has been to let me enjoy the beach more. Second, I'm involved in a couple of pretty compelling projects, and these are keeping me active out in the world, also away from the keyboard. So all told, I've been spending a lower than usual percentage of my time at my desk. And that's translated to less blogging. FWIW I'm way behind on READING blogs too. I intend to return to the blogging routine eventually. Probably sporadically, at first. But eventually on a regular schedule. Stay tuned. For the better part of two years, the word coming out of the Bush White House was that presidential adviser Karl Rove had nothing to do with the leak of a female CIA officer's identity and that whoever did would be fired. But Bush spokesman Scott McClellan wouldn't repeat those claims Monday in the face of Rove's own lawyer, Robert Luskin, acknowledging the political operative spoke to Matthew Cooper of Time magazine, one of the reporters who disclosed Valerie Plame's name. "I'm not sure why "War of the Worlds" is considered science fiction. I mean, somebody traveling millions of miles to kill Tom Cruise doesn't seem all that far-fetched to me." Robot musical instruments that are operated by computer. Lemur: League of Electronic Musical Urban Robots. It turns out that in the days after the Redsox won the World Series last fall, people did a lot of, umm, celebrating. Nine months later, we have new members of Redsox Nation. There are already signs of a ''Red Sox phenomenon," according to Isis Maternity, the largest provider of childbirth education and parent services in New England. The due dates start roughly in mid-July, nine months after the Evil Empire was destroyed in four straight games, and continue through August. ''Last week we sold more memberships than we had any other week," said Jo Myers McChesney, cofounder of Isis Maternity. ''There could definitely be a little bit of a Red Sox phenomenon going on. People being fired up after the playoffs and the World Series. We have strong class enrollment for couples delivering in late July and August, and they may very well end up being higher than other months." Red Sox newborn baby clothes are flying off the shelves faster than Dave Roberts dashing for second base. I don't know if this is the right plan, but I'm totally with the idea of throwing out the first one and starting from scratch. David Clark, who led the development of the internet in the 1970s, is working with the National Science Foundation on a plan for a whole new infrastructure to replace today's global network. The NSF aims to put out a request for proposals in the fall for plans and designs that could lead to what Clark called a "clean slate" internet architecture.